The Navy's newest oceanographic survey ship, the Mary Sears, is about to leave Unix in its wake. Within a year, Microsoft Windows NT and Linux will replace the ship's IBM OS/2 and HP-UX operating systems. 'We're switching to PC-based systems because the programs run much faster, the hardware is cheaper and PC market technology has faster updates,' said Ed Gent, ship's manager of the Naval Oceanographic Office at Stennis Space Center, Miss. The Navy recently launched the vessel from the Halter Marine Shipyard in Moss Point, Miss. 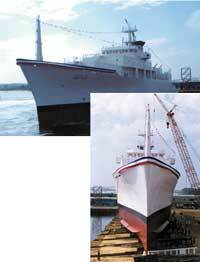 The primary purpose of survey ships is to map the ocean floor to update nautical charts. The ships also sample water column physical properties and the composition of the ocean floor, officials said. The Mary Sears, the Navy's newest oceanographic survey ship, gathers raw data, then analyzes it with the latest sonar tools. All the Navy's oceanographic survey ships carry the latest in over-the-side sensors and sampling gear, including bathythermographs, bottom corers and seismic equipment. Additionally, oceanographic vessels launch and recover various instrument packages, and conduct acoustic property measurements. The Oceanographer of the Navy's mission in supporting Navy fleet operations has expanded to include interpreting ocean and weather conditions, to ensure the safety of operations and to provide a tactical edge in harnessing that environment, officials said. To date, 75 percent of ocean waters either have never been surveyed or were surveyed many years ago using outdated instruments. The Mary Sears uses two types of sonar mapping: a 12-KHz system for deep water and a 95-KHz system for shallow water. Konigsberg-Simrad of Seattle manufactured both systems. The vessel also uses side-scan sonar systems. These towed systems produce high-resolution images of the sea floor. Not only do these ships gather raw data, but they also process and analyze it with sophisticated on-board systems. Although all sonar systems have their own standalone collection and data processing systems, they are networked in real time to a central data collection computer'a Hewlett-Packard J2240 running HP-UX. The on-board network also collects real-time data from various ship's instruments including all of the navigation and environmental sensors. 'These machines currently run the OS/2 operating system. Those legacy systems, however, are being replaced. The Naval Oceanographic Office plans to upgrade OS/2 to NT, and HP-UX to Linux. According to Gent, another advantage of Linux is that its hardware independence means the Navy isn't locked into any particular make and model of computer or components. 'Moreover, he said, the price of PC-based components makes them far more cost effective. A software application from Science Applications International Corp. of San Diego is used to bring everything in from the network and display data on-screen on the HP workstation. 'In-depth analysis of oceanographic data, though, is conducted by a government-developed program. SAIC has been contracted to carry out software conversion from the HP-UX and OS/2 platforms to Linux and NT, according to officials. A year or so up the line, the Navy will implement a satellite transmission system to beam oceanographic information to headquarters in real time, officials said.